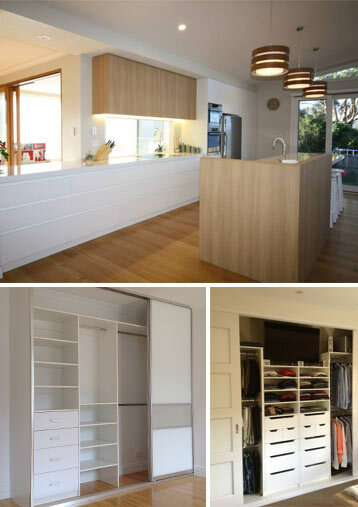 Tailored Flat Packs Direct offers much more than the manufacturing of cabinetry projects. We have helped many clients bring their visions to life through our design and 3D render skills. Tailored Flat Packs Direct can help clients who require the full service of designing a new kitchen, walk-in robe, vanity unit, wardrobe, book case, laundry from scratch. If you are strugglingly to find the best solution and lets face there are so many ways of achieving the end result it can be baffling and a little overwhelming. We can help you achieve the right finished product be helping to understand your objectives (how you want to use the space). If we are designing a kitchen we need to understand how you will use your kitchen. What kind of appliances you have (stove, oven, fridge size etc). What shape the space for you kitchen is and how this relates to the rest of your house. Our years of experience means we can often sees issues before they become expensive issues. Take the guess work and frustration out of envisioning what your new kitchen or bathroom will look like by asking us to create a 3D render. The technology we have is amazing at creating photorealistic 3D renders. Check out our 3D gallery to see a selection of our 3D renders. How much is this going to cost? Well the short answer is every project is different so in order to get an accurate price, give us a call and we will discuss your needs and provide you with a free quote. At Tailored Flat Packs Direct we pride ourselves on our personal service, we understand the importance of communication and also understand our industry doesn’t have a great reputation for communication. There are no stupid questions, so ask away, we want you to fully understand how we work and how we can help make the whole process and seamless enjoyable experience.